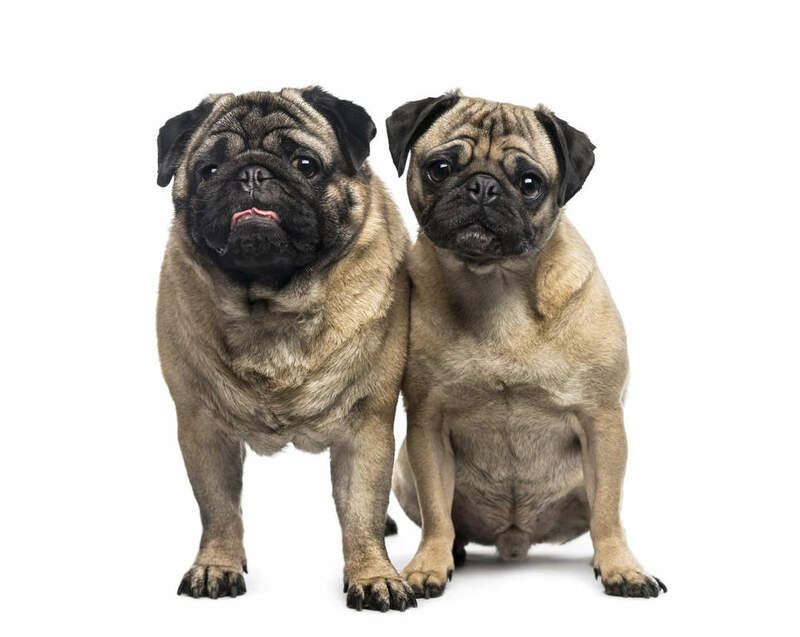 The pug is descended from the mastiff breed and was first thought to have been created in the Orient centuries ago, It was a popular dog in Tibetan monasteries and moved from China to Europe with The East India Trading company in the 1700's. The word Pug probably comes from the Latin 'Pugnus' meaning fist as it's head resembles a clenched fist, or the marmoset 'pug' monkeys that were popular as pets during the 18th century. 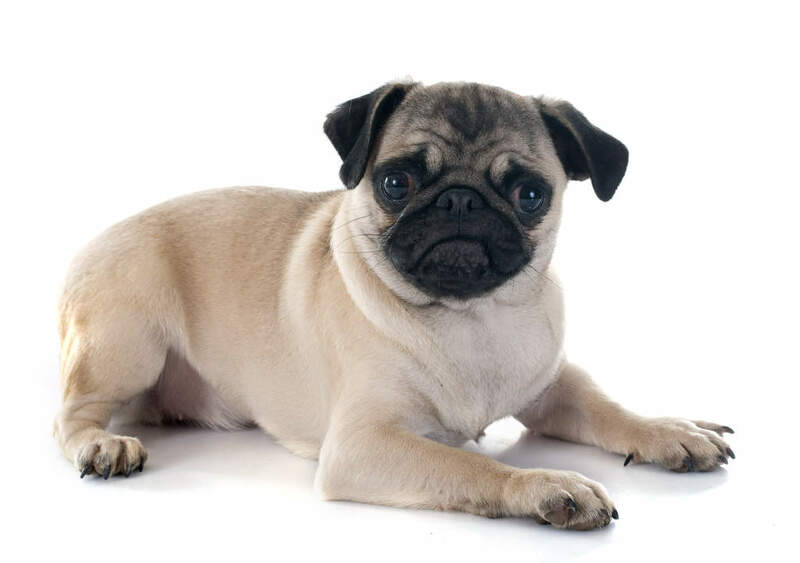 Pugs are funny, playful and friendly dogs. They are great with families and children and love attention and showing off. They make wonderful companion dogs and are never far from your side; hence their nickname, the shadow. Being close to their owner is what they were bred for and they are very good at it. They are affectionate and confident, but will act the clown for attention when ever possible. They will climb on to your lap on the sofa, your bed and the chair when you are eating dinner. Anything to get as close as possible. They are also very greedy and can eat for England. 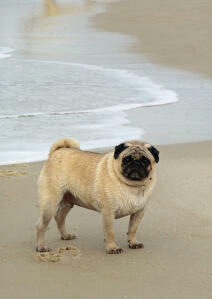 Pugs are friendly towards other dogs, pets and strangers and as a rule are rarely aggressive. They need a daily walk but would much rather take a nap on their favourite chair, rather than face the rain and cold. 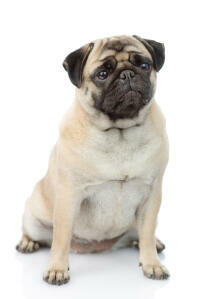 They can be lazy and prone to obesity, so regular walks and watching their food intake is important. They have a large personality, but aren't the smartest of dogs. They learn quite slowly, but are trainable, with patience. They won't chase a ball, or run after a frisbee as that involves far too much effort. They have moments of total relaxation where you will struggle to rouse them from sleep, to a mad dash around the house, chasing nothing, then back for a well deserved nap. With their flat faces, breathing can be a problem when it is very hot. They can over heat when out on walks, so little and often is best for them. Washing their faces prevents problems with the skin folds. They tend to sneeze, wheeze, snort and fart a lot as a breed. 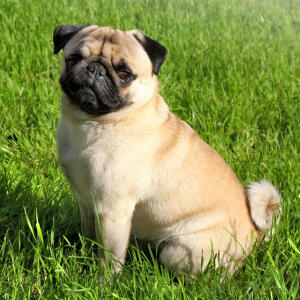 Coat care is minimal, with short fur, they just need brushing a couple of times a week to remove dead hairs. As mentioned, obesity is common. 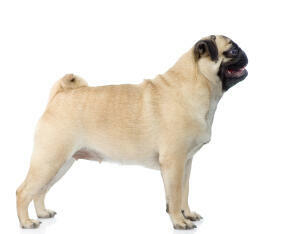 Canine Hip Dysplasia can sometimes be seen as well as Pug Dog Encephalitis in some young dogs. 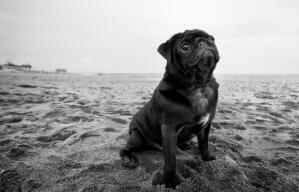 Pugs have a dependent and comical temperament. Happy little dogs who enjoy your companionship it is fair to say that Pugs love hugs! Comical little dogs that will snort and snuffle anyone they meet but be jealous of any animal that has taken their spot on your lap. 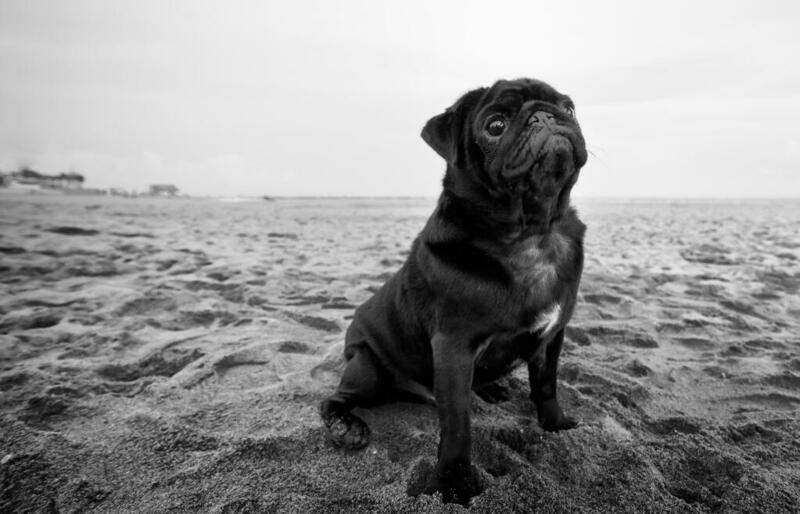 Stubborn little dogs, they can be tricky to train but are generally quite biddable. Health problems that may affect pugs include brachycephalic syndrome (breathing difficulties), canine hip dysplasia (CHD), cataracts, entropion (inward rolling of eyelid which irritates the eyeball), eye damage, epilepsy, patellar luxation (dislocation of the knee cap), allergies and pug dog encephalitis (an inherited inflammation of the brain).